Wyatt Blaine, still grieving the loss of his wife and son, decides to reopen the equine therapy program his late wife had begun. When Gabby MacPhereson, the widow of the man responsible for Wyatt's grief, begs to enroll her son, Trevor, in the program, Wyatt reluctantly agrees. As Trevor begins to respond to the therapy, Wyatt and Gabby find themselves drawn to each other, yet remain separated by tragedy. Will they be able to navigate through forgiveness to find peace and love again? I don't want to do this, but I'm afraid I have no choice. The premise of If Wishes Were Horses intrigued me and it could have been great, but it fell flatter than a pancake for me. This was a cheesy chick flick type novel that felt over the top with cariacture characters, forced plot and dialogue. On the cover it is compared to Nicholas Sparks, who I've never read before, so can't comment, but I hope they mean the story of love and redemption. 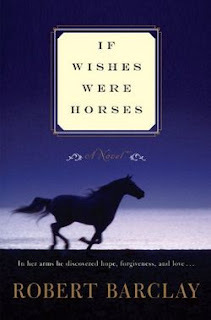 I've seen The Notebook and I've no doubt the intention is for this novel is to be made into a movie - that's exactly how it reads - but If Wishes Were Horses lacked depth and emotion for me. Hopefully the right acting and directing can pick up where this story lacks. The love story between Wyatt and Gabby seemed off right from the beginning. It didn't feel natural at all and their initial meeting to suddenly having weird feelings to wondering what those feelings were to falling madly in love just didn't jive. Something about the progression seemed odd. I also couldn't figure out why Wyatt would hold the accident against Gabby and Trevor. They weren't driving the car. I understood why he might not want the reminder of them there day after day, but the initial anger didn't seem justified and then the sudden thawing was odd too. Trevor's angst at Wyatt though seemed slightly more realistic as he was a child at the time of the accident, but I still had a hard time with it all. I also couldn't grasping Ram's huge secret and yes, it was sad, but the reaction of his sons seemed well over the top for me. The dialogue felt forced and don't get me started on the dialogue tags 'he whispered stealthily' or the amount of exclamation points peppered through the dialogue! I couldn't even get a feel for the setting much of the time or the description which went much like this: "Celia took another sip of Gabby's coffee. It was hot and good", and my favourite "At forty five, Celia remained an attractive woman." Really? This sentence did nothing to help me picture the woman, all it did was offend me instead. I was disappointed not to see more of the actual equine therapy in this novel. It was glossed over to focus on Wyatt and Gabby which was unfortunate as it would have added another layer to the story. There a few moments that I did wonder what was going to happen and the last scene before the epilogue was a bit of a surprise, but it didn't compensate for the rest of the novel for me. I anticipate seeing this on the big or small screen soon where I hope it will redeem itself as a better screenplay than novel.